Effie Louise Boadway, 80 of Traverse City, died Saturday, June 3, 2017. She was born on July 19, 1936 in Rochester, Michigan the daughter of Auto and Marguerite (Bassett) Montross. She graduated from Rochester High School. Effie married, Kenneth Boadway on March 17, 1956. They moved to the Traverse City area in 1966. Effie and her husband farmed 88 acres. 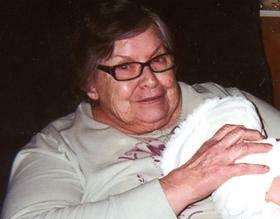 She loved to be with her family, being a homemaker and raising 5 children. Effie enjoyed her 11 o'clock swimming and aerobics (social) time with her ladies at the Civic Center Pool. Bingo and word search puzzle books were a great pastime for her. Effie is survived by her children, Brenda Woodcox, Timothy (Kate) Boadway, Sandra Trigg, Philip Boadway and Cynthia Candey; grandchildren, Monica (Guthrie), Jennifer, Sarah (Brandon) Brian, Anthony and Logan, great-grandchildren, Skylar, Emilee and Tommy; siblings, Peggy Frisch and Gordon Montross; nieces and nephews and great nieces and nephews. She is preceded in death by her parents, husband, Kenneth Boadway and brothers, Earl and Carl Montross. An informal gathering will be held 1pm to 4pm, Saturday, June 17, 2017 at Life Story Funeral Home, Traverse City. Memorials may be made to the Grand Traverse County Commission on Aging. Please visit www.lifestorytc.com to sign the guest book, share your thoughts and memories and more.